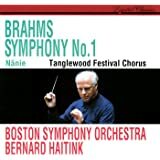 The first and final movements of Brahms's Third Symphony contain some of the most dramatic music he was to compose, yet both end serenely and enclose two beautiful inner movements. 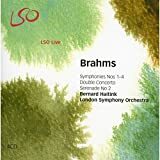 The equally exquisite Serenade No 2, unusually scored for wind instruments, violas, cellos and double basses, was one of his own personal favourites and both receive superb performances under Bernard Haitink in the third part of his internationally acclaimed LSO Live Brahms cycle. Haitink's critics have never been happy with his recessive podium personality, calling it bland and mediocre. But there are othes who love him for being the anti-Bernstein, relying on quiet musicality in place of showmanship. I often fall into that camp, but here Haitink goes too far. 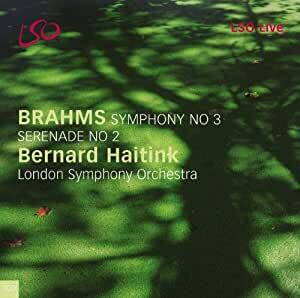 His live Brahms Third with the LSO barely exhibits an interpreatation. Haitink is doing more than sitck-waving, of course. He is gently shaping, balancing, and guiding. Yet he does all three things so gently that it's hard to pay attention. I went back to his early Brhams with the Concertgebouw from the 1970s, expecting it to be much faster. But this London-based Third is surprisingly close to the early one. What's lacking is a convincing sense of drama, pace, and vitality. The orchestral playing is relaxed (how oculd it be otherwise?). It's stingy to put each symphony one to a disc, but here we get the wonderful Serenade #2 as a generous filler. In his Philips cycle Haitink brought off one of the best performances ever recorded. He sitll has the knack--this reading isn't asleep on its feet like the symphony--but now it's 2 min. shorter--more "autumnal" as critics like to say when a good performance is underpowered.